Svenja O’Donnell has worked as a print and television journalist for the past 15 years. 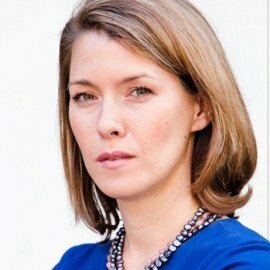 As Bloomberg’s UK political correspondent, she was awarded the Washington-based National Press Club’s Breaking News award in 2017 for her coverage of the Brexit referendum. Prior to that role, she reported on a variety of subjects from economics to conflict zones. Her assignments have taken her all over the world, including a posting as Bloomberg’s Moscow correspondent, and reporting from Sudan for the Financial Times. Her articles have appeared in a number of publications including Bloomberg, Businessweek, the Sunday Times, and the Financial Times. She is a regular contributor to the Political Quarterly. As well as regularly featuring on Bloomberg Television as their UK political commentator, she has made television appearances on the BBC, Sky News and France 24. Svenja grew up in Paris with a German mother and an Irish father, before attending university in the UK. She speaks five languages, and holds an MA in English Literature and History of Art from Edinburgh University, as well as a Masters in Print Journalism from City University.